It’s a morning of 2016, Barbaria della Tole, a long callethat leads from beautiful campo dei SS. Giovanni and Paolo to the heart of Sestriere di Castelllo. A knot of people is collected around a shop window. In the middle, towers the image of an elephant waking around a Venetian calle, surrounded by two wings of curious crowd looking out of their balconies. What is it? It’s the circus… I remember it, it must have been in 1958… or maybe before, my daughter wasn’t born yet… they wouldn’t fit on the float boat, so they crossed the city… It was the Togni circus… No, no, the Orfei one… it would come every year… Yes, sure, in Campo San Polo too… There’s even a painting by Longhi at the Correr museum with a rhino… But it looks like a hippo… I read that once, an elephant ran away from Campo Bragora… But what does this shop sell? Dreams maybe. 320,000 exactly. There are enough to make a city much bigger than Venice dream. You can’t ask a photo for the truth, at most a photo can give us back some shreds of it and it’s up to us to put them back together, working with our imagination and our memory. But memory is fleeting, especially if it’s entrusted to chemistry and oxidation principles. Vittorio is racing against the clock, since he took over a former bakery to house his 700 boxes of negatives and contact prints, he has been fighting a lonely fight to save a piece of our collective memory from oblivion. Pictures of chronicle events, of costumes, artistic photos that range from the forties until the eighties. There’s Dior’s mannequin, but also the Vajont tragedy; there’s Paul Newman bathing in the Lido’s waters, and excavation works for the canals. 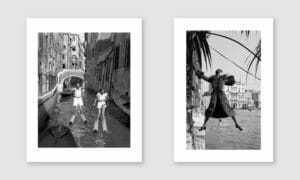 Vittorio has a huge digitalization effort in front of him, a daily trip between surprises and new discoveries, and who knows, maybe all these photos are hiding an iconic one, to give us a taste of time, such as another “Kiss” by Doisneau, or one by Evelyne McHale. Spread the voice.